The Science Communications Support Office (SCSO) supported 18 domestic and international science conferences and 6 public events in 2017. The SCSO continues to provide an inspiring and interactive venue for every event during the year, using a unique storytelling approach that allows a variety of audiences worldwide to connect with NASA Science. The 2017 Annual Report provides an overview of these activities with details about new Hyperwall stories, publications, social media, key partnerships, and more! Read more about Understanding Earth: What's Up with Precipitation? The Science Program Support Office (SPSO) supported 25 domestic and international science conferences and public events in FY2016. 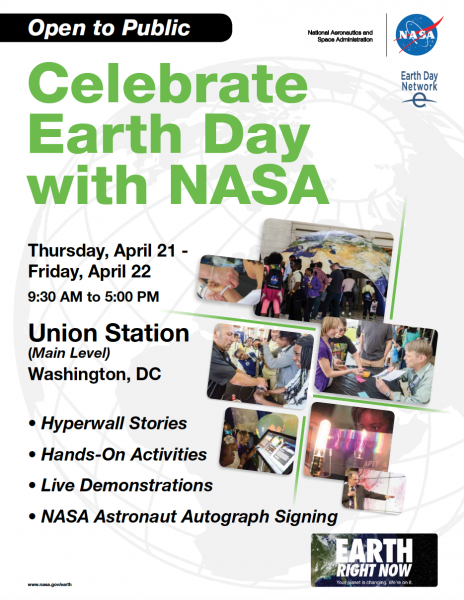 The SPSO strives to provide an inspiring and interactive venue for every event during the year, using a unique storytelling approach that allows a variety of audiences worldwide to connect with NASA Science. The 2016 Annual Report provides a broad overview of these activities, along with details about new Hyperwall stories, publications, social media, key partnerships, and more! Registration is now open for the 3rd International A-Train Symposium, to be held in Pasadena, California, April 18-21, 2017. For over a decade, the A-Train Constellation has successfully collected a uniquely comprehensive environmental dataset. The symposium will be an opportunity to learn and exchange information about A-Train scientific breakthroughs and to highlight how Earth science has benefitted from the long, continuous, multi-sensor dataset. Please visit https://atrain2017.org for more information. The Deep Blue aerosol project now has its own website: deepblue.gsfc.nasa.gov. Deep Blue is the name of an algorithm that uses measurements made by Earth-orbiting instruments to determine the amount and properties of aerosols in the atmosphere. In this context, the term aerosols describes particles suspended in the atmosphere, including—but not limited to—desert dust, smoke, volcanic ash, industrial smog, and sea spray. Improving our understanding of aerosols is important for reasons related to Earth's climate, human health, ecology, and more. 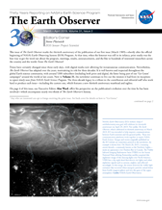 The site is intended to act as a single resource for the various current and forthcoming Deep Blue satellite aerosol data products, based on retrievals from the Sea-viewing Wide Field-of-View Sensor (SeaWiFS), Moderate Resolution Imaging Spectroradiometer (MODIS), and Visible-Infrared Imager Radiometer Suite (VIIRS). The site includes information on and links related to the data products, such as file formats, publications, and data access locations, and some background information on aerosols and aerosol remote sensing for the non-specialist. There is also an RSS feed, to which you can subscribe for information relating to the project, such as new publications or data version updates. Please direct questions to Andrew Sayer of the Deep Blue Project at andrew.sayer@nasa.gov. The beta version of Level-2 (L2) and Level-3 (L3) radiometer data from NASA’s Soil Moisture Active Passive (SMAP) mission is now available at the NASA National Snow and Ice Data Center (NSIDC) Distributed Active Archive Center (DAAC). These data use L-band brightness temperature measurements retrieved from the SMAP radiometer to produce global soil moisture estimates. As of September 9, 2015, the SMAP Science Data System (SDS) began forward processing of the beta (Version 1) L2 and L3 radiometer data, which will be made available at the NSIDC within 24 hours of satellite observation for the L2 data, and within 50 hours for the L3 data. Note that reprocessing of the data from March 31, 2015, to September 9, 2015, to Version 1 will begin at the end of October 2015. Users should be aware that these beta data use preliminary algorithms that are still being validated and are thus subject to uncertainties. The calibrated and validated release (Version 2) of these L2 and L3 datasets is expected to take place at the end of April 2016. To access data, documentation, and tools, visit nsidc.org/data/smap. Note also that the Level-1 SMAP radar data are accessible through the Alaska Satellite Facility Center DAAC at www.asf.alaska.edu/smap. Additional questions can be directed to NSIDC User Services at nsidc@nsidc.org. During FY2015, the Science Program Support Office (SPSO) supported 24 domestic and international science conferences and public events. Each year the SPSO strives to provide an inspiring and interactive venue, using a unique storytelling approach, that allows a variety of audiences worldwide to connect with NASA Science. The 2015 Annual Report provides a broad overview of these activities, along with details about new Hyperwall stories, publications, social media, key partnerships, and more! Click here to see the report. NASA’s Stratospheric Aerosol and Gas Experiment (SAGE) family of remote-sensing-satellite instruments has long measured ozone (O3) concentrations, stratospheric aerosols, water vapor, and other trace gases that influence Earth’s atmosphere. Planned for launch in 2016, SAGE III on the International Space Station will continue the legacy of accurate SAGE measurements. This brochure provides details about the instrument, launch and installation, ground system and data, and more!